A landmark Sliema building – known to locals as Id-Dar il-Ħadra (the Green House) – is the latest characteristic townhouse to be targeted for demolition. The mid-19th-century building in St Agatha Street and known for its unusual green facade (currently in a poor state of repair) is proposed for demolition to build a maisonette, 11 apartments, a penthouse and basement garages. The application has not yet been assessed by the Planning Authority, and a decision is expected in July, but the proposal immediately raised concerns among conservation groups. According to the Sliema Heritage Society, the building is in one of the town’s oldest streets and contains the niche of the Assumption of Our Lady, one of Sliema’s most revered Catholic shrines, which also gives its name to St Mary Street, directly ahead. Moreover, it contains several architectural elements, particularly a colonnaded staircase and garden arcade, which the organisation argues are worthy of preservation. In a representation to the PA, the society called for the facade and its characteristic green hue to be preserved and incorporated into the new project, along with its most important internal architectural features. The St Agatha Street property is just a stone’s throw away from a similar townhouse spared demolition just weeks ago. The house, one of a well-preserved row in the adjoining St Mary Street, was proposed for replacement with an eight-storey hotel, but the PA rejected the application unanimously amid copious objections from residents, NGOs and the local council. In its decision, the Planning Authority referred to the objections of the Superintendence for Cultural Heritage, which had said the house had historical value and should be retained. Flimkien Għal Ambjent Aħjar environment officer Tara Cassar told the Times of Malta that the SCH should similarly intervene against the proposed St Agatha Street demolition. 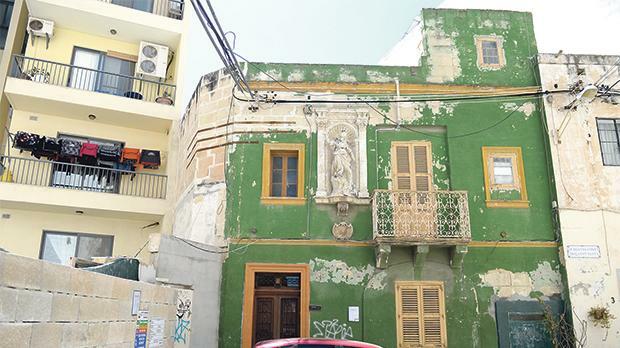 “This street has been stripped of its Urban Conservation Area status, leaving some of the oldest houses in Sliema completely unprotected,” Ms Cassar said, calling for the PA to protect the remaining heritage buildings from destruction. Sliema has seen a marked in-crease in applications for apartment blocks and guesthouses in place of traditional townhouses over the last year, despite the consistent objections of the local council and NGOs. Many of the developments were approved by the PA despite the list of complaints, with the authority commonly citing existing apartment blocks in the same area as evidence that the row is already committed.